This festive Easter Wishes Gift Basket is a great way to send warm springtime wishes to loved ones and friends this Easter holiday. 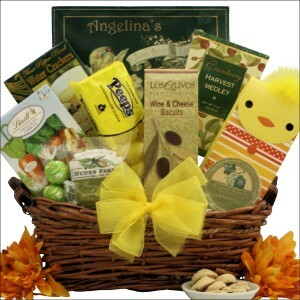 This beautiful basket features Mille Lacs Foods Assorted Wine Flavored Cheese Cup, Three Pepper Blend Water Crackers, Cranberry Harvest Medley, Peeps Marshmallow Chicks, Lindt Milk Chocolate Carrots in an Easter Gift Box, Angelina's Sweet Butter Cookies, and more. With such a wonderful assortment of Easter treats, this gift is perfect for the whole family! ... in a Rectangular Gift Basket hand-tied with festive ribbon.